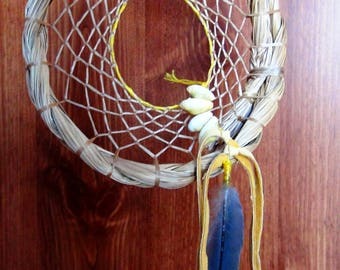 Measuring around 12 inches in height and 9 inches in width this Dream Catcher is stretched on hand harvested peeled wild grapevine. 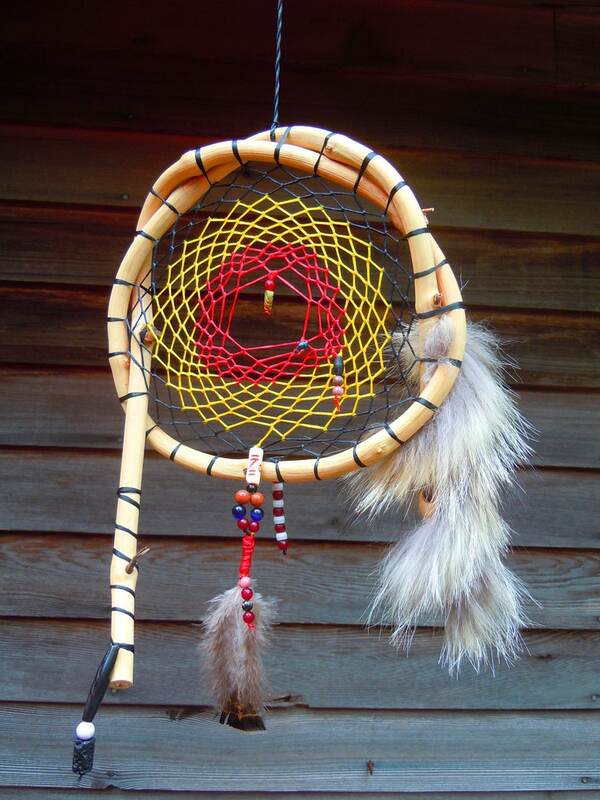 The web is stretched taught and the web is multicolored using black, yellow and red fiber sinew. This striking dream catcher is decorated with beads of faceted fire agate, blue cats eye, goldstone, howlite, white glass, black glass, wood, carved water buffalo bone, black steer horn, a chunk of real lava, turquoise and rhodolite. In the very center is a caved jade leaf. A Vermont wild turkey feather hangs from the bottom and the right side is wrapped tightly with a strip of western coyote fur.